Apples symbolise health and healing. This sweet fruit said to keep the doctor away focuses you on wholeness and wellness. Apples represent our ability to nourish our bodies and minds and to love and care for whole selves. Apples are symbolic of health, energy, strength and vitality. Turquoise is the healing stone. 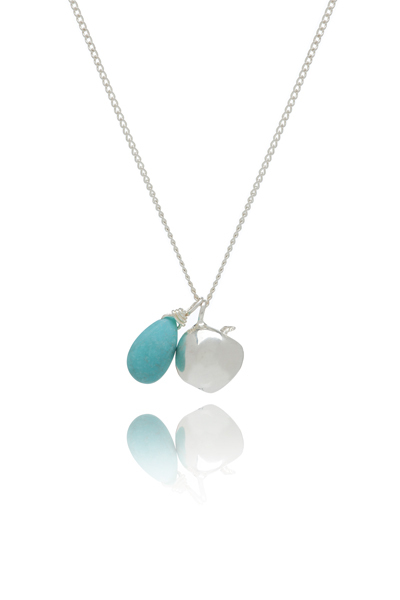 This vivid aqua blue stone represents health and strength. A stone of inner wisdom and protection Turquoise inspires strength, dispels negativity and boosts immunity. A soothing strengthening stone that attracts positivity and energy helping us tap into our power to heal ourselves. Apples symbolise health and strength. Turquoise is the healing stone. Use this talisman to focus on wellness and vitality, tapping into your ability to nourish and heal yourself. Celebrate your amazing body and the beauty of your whole self. The HEALTH necklace is about health, vitality and strength.